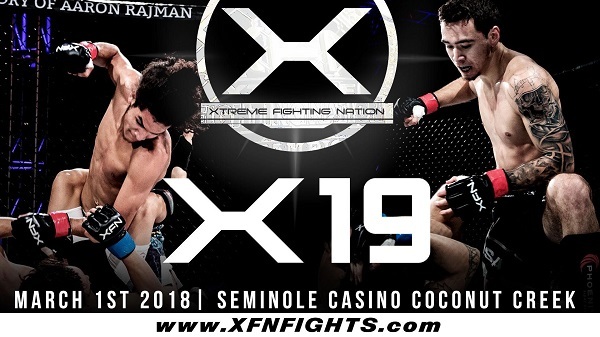 Xtreme Fighting Nation (XFN), in association with Unconquered Promotions will hold XFN 19 at The Pavilion at The Seminole Casino Coconut Creek in Coconut Creek, Florida, Thursday, March 1. Raiyan Anwaar (5-1) has proven to be a top prospect at 145lbs. Anwaar trains under the tutelage of multiple time world jiu jitsu, and EBI Combat Jiu Jitsu champion, Vagner Rocha, as well as the recently re-designed Blackzilians MMA team in south Florida. With the calibre of jiu jitsu training he gets, you would expect the 6’1 featherweight to showcase more of his submission skills. However, with 3 of his 5 victories coming by way of knockout, Anwaar has shown that he likes to use his ground skills to keep the fight standing where he enjoys showcasing his unorthodox striking style. Standing across the cage from Anwaar will be the runner up in the XFN 2017 Tournament of Titans, Devin Dorsey. Dorsey (9-8) was riding a four fight winning streak leading up to his tournament finale bout against Tywan Claxton with three of his four wins coming by submission. A hard takedown leading to a separated shoulder ended the bout for Dorsey, but after a year of rehabbing his shoulder and sharpening his boxing skills at Canino’s Boxing Studio, he is ready to prove that he is the next in line to wear XFN gold. The XFN 19 co-main event is a world amateur middleweight title bout featuring Zdenek Polivka representing the Czech Republic and former light-heavyweight title contender Shane O’Shea. Polivka (9-3) is returning to for his second bout in the United States after gaining experience fighting in four different European countries. O’Shea (7-2) is returning to XFN after a three year layoff and will be competing in his third weight class. His victories include 5 KO’s and one submission leaving only one of his fights going to a decision. The winner of this bout will determine the new champion in the vacant XFN middleweight division.